Today in Masonic History John Theophilus Desaguliers passes away in 1744. John Theophilus Desaguliers was a French-born British natural philosopher and clergyman. Desaguliers was born Jean Théophile Desaguliers in La Rochelle, France on March 12th, 1683. His father, several months before Desaguliers birth was exiled by the Catholic government as Huguenot and was forced to flee to England. After Desaguliers birth his mother fled with her new born son to England to Desaguliers' father. Sometime after arriving in England Desaguliers' parents anglicized his name to John Theophilus. Desaguliers attended Bishop Vesey's Grammar School until 1705 when he entered Christ Church, Oxford. He graduated with a Bachelor of Arts in 1709. 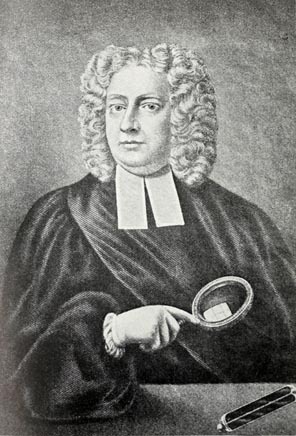 Starting in 1709, Desaguliers gave lectures in Hart Hall on Newtonian natural philosophy. The lectures were a forerunner to Hertford College, Oxford. Desaguliers obtained his master's degree there in 1712. In 1719, Oxford granted him an honorary degree of Doctor of Civil Laws. Desaguliers was ordained a deacon in 1710 and a priest in the Church of England in 1717. In 1712, Desaguliers moved back to London and began giving lectures in Experimental Philosophy. Giving the lectures was by no means a new idea, Desaguliers was the most successful at it. This may have been in part due to his willingness to give the lectures in French, English or Latin. He designed apparatus to help illustrate concepts he spoke of in his lectures. This included a model of the solar system. Eventually he would lecture to the Royal family. In 1714, Isaac Newton asked Desaguliers to become the demonstrator at the weekly meetings of the Royal Society. Eventually Desaguliers would be made a Fellow of the Royal Society. Desaguliers promoted Newton's ideas and maintained a scientific nature to the meeting. He also received the Copley Medal, which is given for outstanding research in any scientific field, three separate years. The final one was in 1741, was for a dissertation called “Dissertation concerning Electricity." In the paper he coined the terms conductor and insulator. Desaguliers also applied his mind to engineering matters. This included the application of steam engines, hydraulic engineering and ventilation. He devised a more efficient fireplace that was used in the House of Lords and a blowing wheel that removed stale air from the House of Lords. He also studied the human body when working as a machine. Desaguliers passed away on February 29th, 1744. It has been reported by various sources that he passed away poor and alone. This is largely based on a poem James Cawthorn. The point that Cawthorn was making in his poem was that men of science are not given the financial support they need. Desaguliers was never wealthy, he did have financial resources of his own when he passed away. Desaguliers was a member of Lodge No. 4 which me in the Rum and Grapes Tavern in Westminster. Lodge No. 4 was one of the three original lodges that came together to become the Premier Grand Lodge of England. He is credited with the early success of the newly formed Grand Lodge. He also worked with James Anderson when he was working "Constitutions of Freemasons", now more commonly known as Anderson's Constitutions. Desaguliers was the third Grand Master of the Grand Lodge of England and served as Deputy Grand Master for several years. In 1731 on a lecture tour in the Netherlands, Desaguliers initiated Francis, Duke of Lorraine in the masonic fraternity. The Duke would become the Holy Roman Emperor. Desaguliers would also preside over the initiation of Frederick, Prince of Wales.